https://sep.yimg.com/ay/yhst-33477391359232/brown-heniochus-butterfly-fish-heniochus-varius-humphead-phantom-bannerfish-6.jpgBrown Heniochus Butterfly Fish - Heniochus varius - Humphead - Phantom Bannerfish ModeratePeaceful75 Gallon7.9 inchesYes, with CautionOmnivore, BrineWestern and South PacificChaetodontidaeSmall 1" - 2"
Brown Heniochus Butterflyfish, Heniochus varius, is often found living on or around the reefs of the Pacific Ocean. Members of the genus Heniochus, also known as Bannerfish, make gorgeous inhabitants of fish only or aquariums. Soft Corals and most Invertebrates should do fine with the Heniochus, but it may likely decimate Stony Corals, as they are a part of its natural diet. Peaceful or non-aggressive tankmates are recommended to reduce stress on the Butterfly. When Butterflyfish are first introduced to the aquarium, they may refuse to eat. Should the fish continue this behavior for three or more days, live food should be offered (if not from the beginning). Food soaked in a garlic product will often entice the Butterfly to eat. Another useful method to encourage some Butterflyfish to eat is to place their food inside of a coral skeleton. Groupings of Brown Heniochus can be introduced simultaneously in the same aquarium, making a stunning display. It is best to make sure that the fish have plenty of aquarium space each when adding a group. Live Rock and multiple places to hide also helps to reduce stress in a group introduction situation. 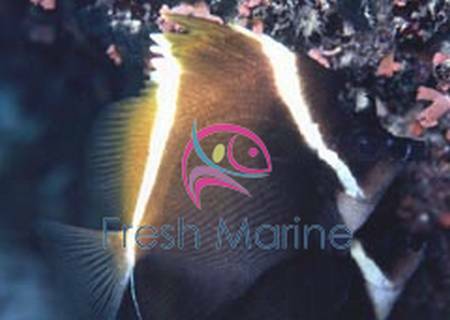 Maximum Size: Brown Heniochus Butterfly Fish can grow to 8 Inches. General Size Specifications: Small: 1 to 2 in. ; Medium: 2.5 to 3.5 in. ; Large: 4 to 5 in. Minimum Tank Size: Brown Heniochus Butterfly Fish prefers a tank of at least 70 gallons with plenty of places to hide & swim. Feeding and Diet: It will feed on a variety of prepared foods with specific success being achieved with bloodworms, brine shrimp and green algae formulas. Breeding: The Brown Heniochus Butterfly Fish is an egg-scatterer.